The hospitality industry is a broad category containing the many different types of businesses we rely on to deliver us with memorable experiences. Restaurants and bars, accommodations, travel and tourism – people have more choices than ever before of places to spend their hard-earned dollars and expect prompt service, customized to their specific needs. Differentiating your business in the hospitality industry comes down to the quality of customer service and level of attention to detail. Having a solid line of communication for your team can be the difference in meeting or missing the needs of your clientele. Has your current communications solution ever negatively impacted your team’s ability to deliver high-quality customer service? From the ninth hole at the Banff Springs Golf Club in Alberta, Canada to a waterfront seat at the Bicycle Thief Restaurant in Halifax, Nova Scotia, companies in the hospitality industry across Canada have been using two way radios (walkie talkies) for decades to stay on top of operations and customer service. As the world of digital technology continues to grow, more companies are making the switch from analog to digital two way radios. But how do you know which type of radio is right for your hospitality operation? A lot of hospitality teams have to compete with structural obstacles, like concrete walls and basements, that can interfere with communications. Analog radios offer a reliable push-to-talk solution, but a common issue users face is a loss of signal in dead zones. Digital two way radios, like Motorola’s MOTOTRBO line, improve audio quality at a greater range than analog radio with better resistance to transmission and reception interference. Digital correction technology also ensures minimal loss of voice communication, even if the signal drops. Lake Louise Ski Resort in Alberta is the second largest ski resort in Canada. Like other large venues, they need a communications solution that covers a wide area and varying altitudes. Both analog and digital handheld and in-vehicle radios send signals over a radio channel user carrier frequency waves, in this case Very High Frequency (VHF) or Ultra High Frequency (UHF). However, using frequency modulation (FM), a typical analog signal will continuously deteriorate as it moves closer to its maximum range until only white noise is heard. Digital radios produce 40% better coverage by automatically converting your voice into simplified computer language that can be transmitted more efficiently over greater distances. Motorola MOTOTRBO digital two way radios offer features like built-in Intelligent Audio technology that will automatically adjust the volume level based on background noise so your message is always heard loud and clear. The hospitality industry is no stranger to long shifts that extend well beyond the typical 9-5 work day. Operations that run 24/7, like the River Rock Casino Resort in Richmond, British Columbia, need devices that last over a full or multiple shifts without the hassle of constantly changing out the battery or swapping their radio for a fully charged one. While both analog and digital radios consume about the same amount of power in standby mode, once you start transmitting, digital radios are dramatically more efficient. Battery life is extended up to 40% on a digital radio system, with some MOTOTRBO radios reaching upwards of 24 hours of operation before they need a charge. 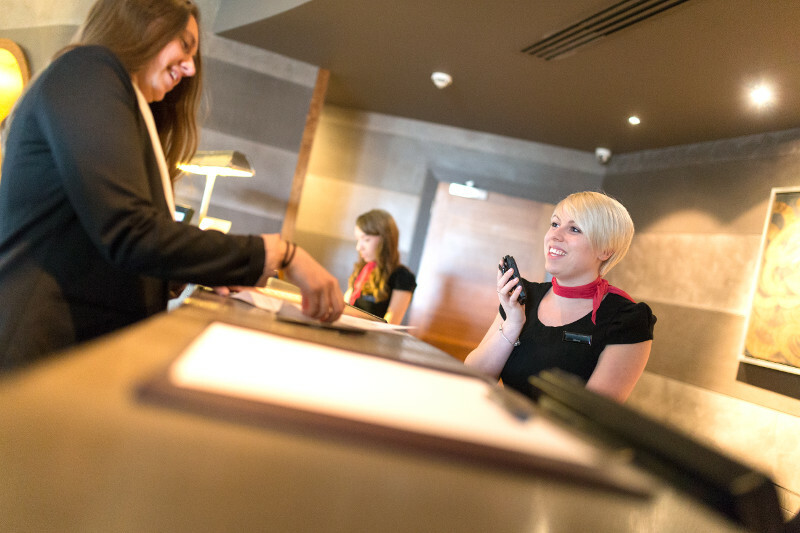 While providing high-quality customer service remains the focus of the hospitality industry, having emergency protocols in place to ensure the safety of your staff and guests should be at the top of your list of priorities. Most analog radios can only handle one conversation at a time on each channel, limiting efficiency and creating the potential for uncoordinated and longer response times during an emergency situation. Digital two way radio technologies divide single-call channels to double the call capacity, supporting up to 4X the number of users compared to an analog radio system. Added MOTOTRBO safety features like Lone Worker, Man Down, Transmit Interrupt, and GPS Tracking provide digital radio users with added protection and more ways to effectively respond in an emergency when every second counts. Most digital portable and mobile radios also have built-in Bluetooth, enabling wireless pairing with accessories, like headsets and speaker mics, to keep your staff’s hands and focus on the job. Considering analog radios have been the industry standard since the 1930’s, most companies have become accustomed to using this type of system. While we understand the “if it ain’t broke” approach, there are a few factors to consider about an aging analog system. Just like when cell phones were first introduced, they were all analog but as more people became dependent on their cell phones digital devices were introduced to meet the demand. Analog radio fleets require transmission-specific receivers and only offer hardware upgrades, with little to no availability for updating software and technology. This makes radio management cumbersome, having to manually troubleshoot and update each radio individually. These restrictions expedite the system’s End of Life and limit scalability options for expanding companies that need to add user groups or more coverage over a larger area. Digital radio systems extend device lifecycles because you can upgrade the device through software and technology instead of buying new hardware like you would have to do for an analog system. With Wi-Fi capabilities and features like Over-The-Air-Programming, digital radios can be managed from a remote location saving time and the cost of manually locating all of your radios. Updates to software and firmware, troubleshooting, work order tickets, and more can be batch-programmed and scheduled for a particular date, ensuring your radios are always up-to-date and functioning properly. Digital radios are also capable of integrating with other digital devices, such as smartphones and tablets, making it even easier to connect your entire team and operation. With digital radios priced at 15-20% more than analog radios, the cost of upgrading is understandably one of the main concerns for most companies. Most people think you need to rip out your old system and completely replace it with digital equipment in order to make the switch from analog. Motorola MOTOTRBO digital two way radios are designed to operate in both analog and digital modes, meaning you can gradually introduce digital two way radios into your current analog system to spread the cost over a longer period of time. Nova Communications also offers managed services, such as Radio-as-a-Service and Wireless-as-a-Service, to give you access to the latest technologies without the cost and burden of managing it all. These turnkey solutions include everything from the devices you need, troubleshooting, updates, system monitoring, and maintenance all for low monthly payments. For more insights of how Motorola MOTOTRBO digital two way radios could benefit your hospitality business, download our free infographic ’20 Reasons to Switch to Next-Gen MOTOTRBO for Hospitality’. Nova Communications is a wireless voice and data communications company and the largest communications systems integrator in Atlantic Canada. Our team of Certified Motorola Specialists has been equipping hospitality companies across Canada with the latest two way radio technologies for the last 30 years.